After an acceptable run at the Nugget in mid April I thought I should set myself a slightly more lofty race target and began drawing up plans for Total Sport's T42 trail marathon. There was only 2 weeks separating The Nugget and the T42 so I wasn't going to be able to pile on any base and even sharpening would be in short supply before the honest taper required in the days prior to a marathon race. It opened up my mind, I saw the sign. Saturday - 2x 2km Cambridge Lake at maximum intensity (Camb lake hill and trail). Nearly threw up after. I'm pretty unbearable at the best of times but my wife can attest to how intolerable I can be when I'm not running (tapering or recovering). Once I have a race in my mind it becomes all-consuming and dominates not only my waking hours. All know her as a very patient and understanding person. With a few days to go I started to contemplate my race plan and execution. 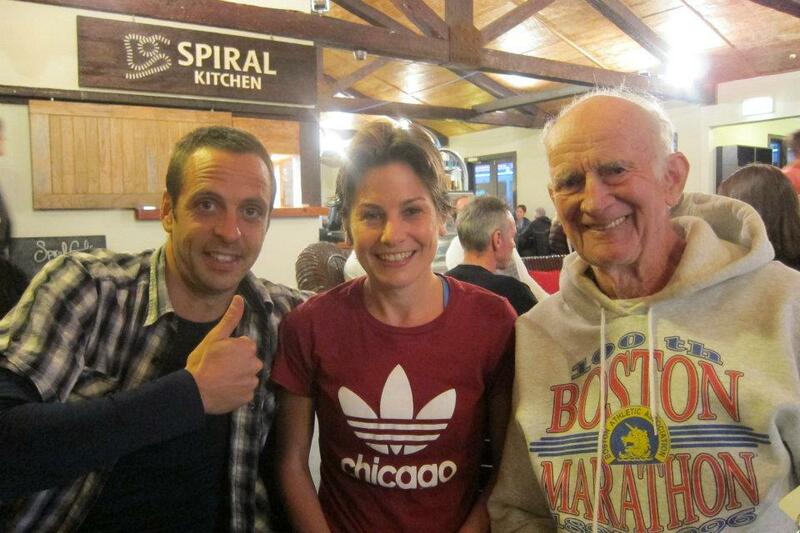 I was going to be up against some capable runners in the shape of course record holder James Kuegler, and NZ Commonwealth Marathoner Craig Kirkwood. James has completed the distance in a smidge over 3 hours and Craig once upon a time ripped out a 2:13. I knew racing these guys would be challenging but I was much more focused on what I was capable of in terms of time. For me, the marathon is really runner vs distance and time. If I was to finish dead last I wouldn't care so long as I ran somewhere around where my current level dictated I should be. Being familiar with the T42 course I had myself placed somewhere around 3:05 if conditions suited. I traveled down the National Park the night before the race and was fortunate enough to be rooming with 79 year old legend Brian Smith (also running the trail marathon) and NZ World Cross Country and Mountain Running rep Sarah Biss. Humbled to be the least talented athlete in the room. Race day dawned frosty, calm and clear (all hail the supermoon!). There would be no excuses as to why a runner couldn't get the most out of the course failing their own stupid shortcomings. Despite the perfect Autumn day we were still required to carry what was around 4kg of compulsory equipment. Never fun having to lug crap you don't need but if everyone's in the same boat I suppose it favors me since I'm regularly on the plus side of my race weight (thanks to my unofficial sponsors Speights and Pizzahut!). 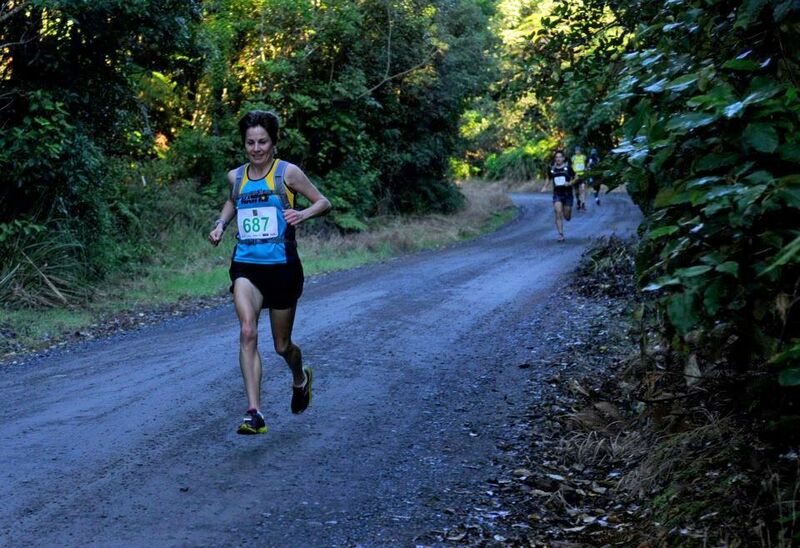 I find out on the start line that Sam Manson, recent winner of The Dual trail Marathon, would be racing. Sam, another athlete in around the 3hr mark would prove to be a capable competitor. GO! James leads out, Sam, CK and myself in tow. Through the 1st 2km Kugs, Kirkwood, Manson and myself entered the trail proper in a measured yet enthusiastic pace. 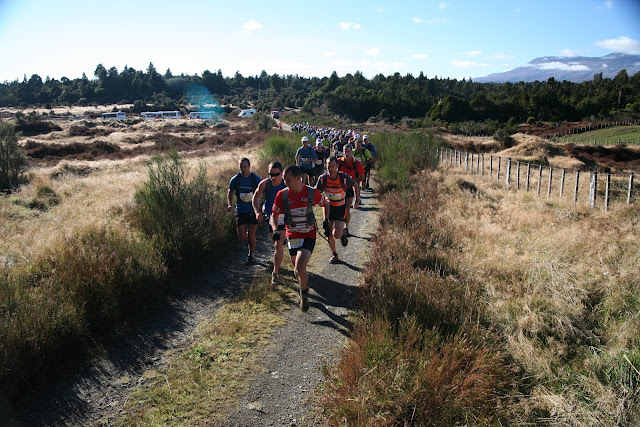 As we rolled along the clay 4-wheel-drive track that would constitute the majority of the 42km I became aware that only 2 runners remained near me. Sam usually only a few strides back and making no sounds of discomfort followed closely by Kirkwood. 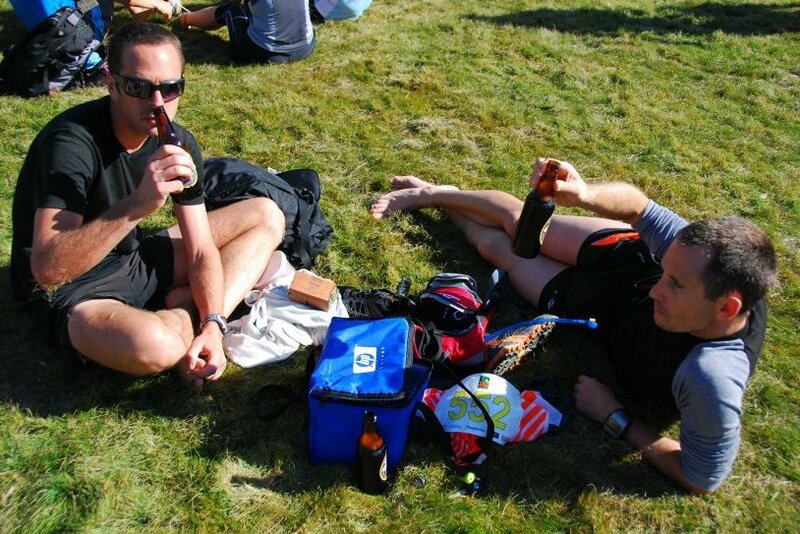 Fellow BarefootInc runner James Kuegler was nowhere to be seen. Having run with James before and seen him race numerous times I was surprised not to have him pushing the pace early on. It certainly was characteristic of his early running career to damage runners in the beginning phases of a race then prove his fitness by hanging on to the finish. Not for the 1st time I began to wonder if his more measured approach to his race would show through in the later stages of the run. In the generous downhill kilometers that followed I seemed to drift clear of the other guys. On occasion glancing at my watch to see I was floating around the 3:40-3:50 pace mark. I managed one quality accident while still in Sams sight falling over nothing at all to take some skin off my knee. Otherwise a fairly uneventful descent to the handful of river crossings that marked the 17km mark. Kirkwood had rejoined me having a good turn of leg speed in the last few genuine downhill sequences. We spoke briefly of the fantastic terrain, conditions and running surface as we started passing through back markers from the 48km mountain bike event which was sharing our course. Smile while you're smashing it. Meanwhile, Sarah Biss still recovering from her 2:39 Rotterdam Marathon was murdering all in her 24km event scalping every single one of the lads and ladies in a rare foray into the trails for her. Big things expected when she retires that silly road ambition. From about 18km there begins an honest but entirely runnable ascent for almost 8km. Craig dropped not long into this and I was left with the company of countless mountain bikers who were either pushing their iron steads or trying desperately to stay in the saddle by spinning it out in 'egg-beater' mode while weaving all over the track. Plenty of support was both given and received as we cheered each other on. I'm counting people shouting "FREAK!" as support. I asked a few of them if they'd seen my bike until fatigue reduced my greeting to little more than "urgh" as I stepped round them. By the top I was hopelessly clear of my running friends and in that unenviable position of not knowing how far back it was to the chasers. At this stage all you can do is open it up and give it everything you have and hope the person behind doesn't have more. Where the hell was Kugs?!?!? 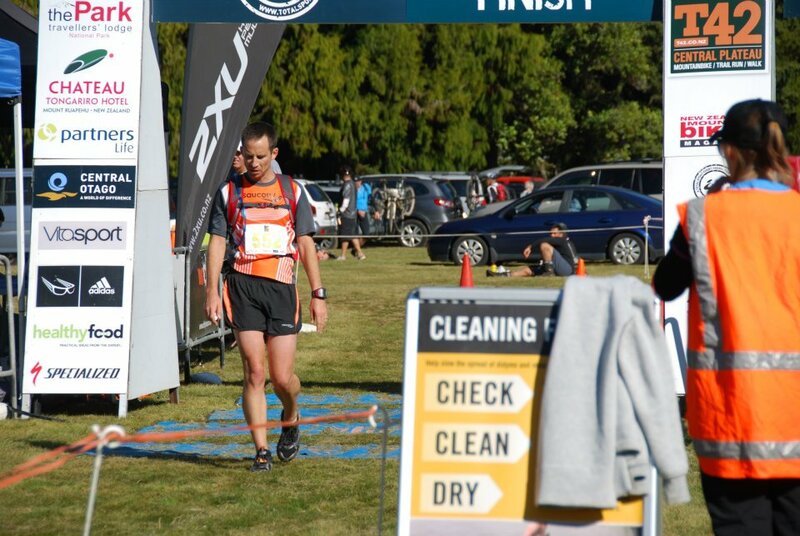 Fatigue was seeping in as I continued to push into the final 15km. I threw in another improv' cartwheel rolly-polly to entertain my new mountain bike friends but this time I bled less falling once more over nothing at all but onto a rare soft section of trail. By 10km to go I was hurting pretty bad and the toll of all those long downhill sections at speed was painfully apparent in my quads as I started struggling to maintain a good rhythm on the flat sections and fail miserably in the ascents. As fortune had it kms 35 through to 40 tending generously downhill so I could hold sub 4min/km pace while mountain bikers hurtled past me glad to be once again in the favorable hands of gravity and inertia. I can't be certain but I'm pretty sure someone shouted "Found your bike! Weeeee!" as they flew by. I knew there was a noteworthy climb separating me from the finish line so it was with abject misery that I crawled into the final uphill. Sometimes walking as I looked back worryingly to see if my early enthusiasm would cost me a placing or two. Fin. Now where's the beer at? I hadn't looked at my watch in a while so was glad to see it stopped at 2 hours 55 minutes as I crossed the line. It was the last thing I saw before the grass came up to meet me. I lay on my face for what seemed like an hour, grass so soft and welcoming I could've stayed there for hours more. My legs were ruined and anecdotal analysis has me thinking I was short a few long runs in training. 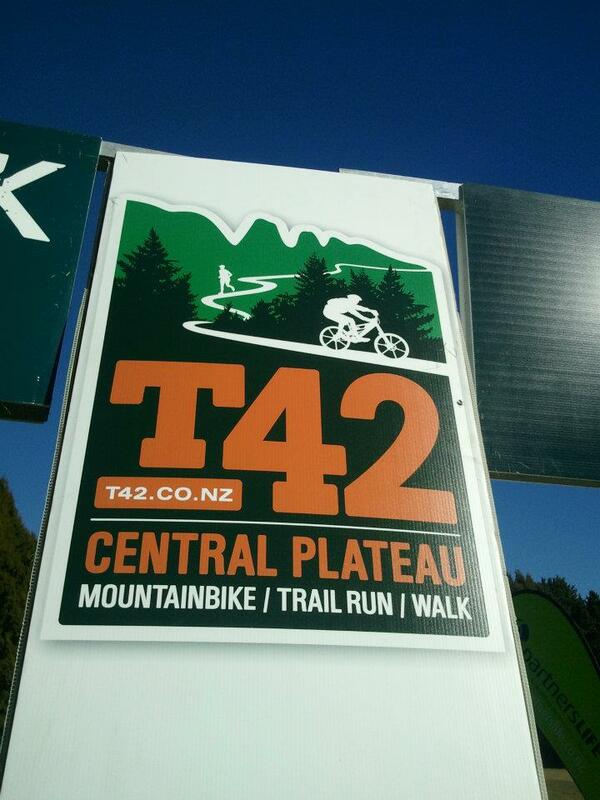 So it for now it stands, T42, 2 hours 55 until someone better comes along or I come back and run it a little smarter. It's a great course, it's open and fast with long downhill sections to hide any number of weaknesses. A capable runner should be able to get it done in the low 2:40s in good conditions but a foolhardy one would find the masses of long climbs crippling. 2xT42 (reversi!) Hrmm.... There are people just mad enough to consider this. 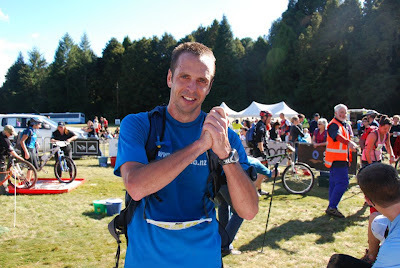 The unconquerable Brian Smith chopped his predicted 6:30 by 4 minutes, and was next seen tucking into a well earned beer. Finally, thanks heaps to BarefootInc for their continued support. A beautiful new pair of Inov8 Talon212s arrived moments too late for me to race in. Looking forward to putting them to the acid test soon. Thanks to Jason Cameron and all the crew at 'The Park Travelers Lodge' for the beer and burgers. Definatelty National Parks 'top spot'. Thanks to Total Sport for getting 990 maniacs across the start line and almost the same number across the finish line. The T42 is truly a magic event. The course is spectacular for racing, and the atmosphere is electric from registration right through to prize giving. I can only assume full scale shenanigans ensued at the after party as the total sport team let their hair down after weeks of hard work and worry. Thanks to Sarah, this entry would've looked like a bunch of boring words without your pics. Lastly, thanks for reading. I would do it without your support but I wouldn't enjoy it nearly as much. Great Stuff Kerry! Good to see you are also supporting the Rod Dixon/John Walker beer diet.